Prepare the data you have already collected and upload it for processing. Maps Made Easy provides an easy to follow workflow wizard to lead users in creating a wide array of outputs. Your images have information embedded in them that let us know where they were taken. This allows us to work our magic and provide you with georeferenced results. 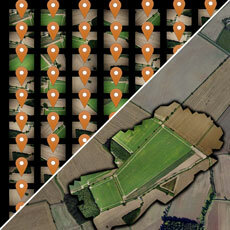 Create orthophoto maps, DEMs (DSMs), NDVI imagery and 3D models. All files listed below are created by default. Use Map Pilot for DJI to collect the most accurate data possible. Terrain Awareness - Maintain a consistent AGL altitude. No Fly Zone Control - Know where you can fly and do it safely. Linear Flight Planning - Fly narrow corridors like roads, rivers and pipelines. Import Maps Made Easy Terrain Data - Use your Maps Made Easy creations to keep up with changes on the ground. Active Connection Mapping - Take the most accurate data possible. Connectionless Mapping - Ensure your images get taken by letting the aircraft trigger the camera. GeoTIFF High quality image at up to 300k x 300k. Georefereced. DEM (DSM) GeoTIFF High quality image at 1/4 of GeoTIFF resolution. Georefereced workflows only. 32-bit elevations with NODATA. Colorized DEM GeoTIFF High quality image at 1/4 of GeoTIFF resolution. Georefereced workflows only. NDVI GeoTIFF High quality image at 1/2 of GeoTIFF resolution. Customizable color mapping. Red or Blue filtered input images. Tiff High quality image at up to 300k x 300k. JPG Compressed image at up to 300k x 300k. Colorized DEM JPG Compressed image at 1/4 of GeoTIFF resolution. Georefereced workflows only. NDVI JPG Compressed image at 1/2 of GeoTIFF resolution. Map iFrame Embed Code Embed the map with all associated layers on any site. 3D Model iFrame Embed Code Embed the 3D Model preview on any site. Textured 3D Model OBJ, MTL and JPG texture files. Dimensions in meters. Textured 3D Model (small) 100k face version of the OBJ, MTL and JPG texture files. Point cloud information is in the OBJ file. Dimensions in meters. Point Cloud XYZ RGB and LAS outputs for compatiblity with CAD and GIS software. 3D KMZ 250k face Google Earth and SketchUp compatible 3D model. URL to Stitched Tile Layer For use in a user's own custom maps. URL to Colorized DEM Tile Layer For use in a user's own custom maps. URL to NDVI Tile Layer For use in a user's own custom maps.